You’ve probably heard this asked at least once in your life, “You’re losing your hair? What did your mother’s father look like?” The thing is, genetics doesn’t work that way. “It’s totally a myth that you should look at your mom’s father,” Joshua Zeichner of Mount Sinai Hospital in Manhattan, told Men’s Health. Hair loss does not come from one side of the family. Many ancestors can contribute to your gene pool. Go ahead and wear your favorite team’s cap. While there is a condition called traction alopecia that causes hair loss due to excessive hair pulling, it’s a far cry from the stress that comes from wearing a hat. “Your baseball cap would have to be on your scalp so tight that you couldn’t wear it in order for it to cause any type of traction or damage,” Spencer Kobren of the American Hair Loss Association told Men’s Journal. This is another area where there are circumstances where the myth can be true, but in all of these cases the hair loss is temporary. Conditions like telogen effluvium, trichotillomania and alopecia areata are hair loss conditions related to stress, according to the Mayo Clinic. This is very different from male or female pattern hair loss which is more permanent. Again, there has been a basis to this myth as the male hormone androgen can interact with hair follicles to make them thinner, Dr. Melissa Piliang of the Cleveland Clinic tells the website health.com. But this is true if you’re using older versions of the pill. “The newer ones developed have fewer of those side effects and are really more anti-androgen,” Dr. Piliang says. “Most people still think of hair transplants as these plug-y, unattractive, cornrow-type of procedures,” Kobren told Men’s Journal. “Those really don’t exist anymore.” When you come to RHRLI and learn about the ARTAS® System, we’ll show you how we harvest healthy donor hairs and transfer them to where they’re needed with far more precision than other procedures that involve handheld devices. RHRLI is the only hair loss treatment center that has the ARTAS® System on Long Island. 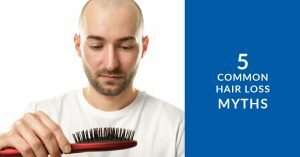 Other hair transplant options, like strip surgery, involve the use of a scalpel and longer recovery times. We’ll offer you a free, no pressure consultation and explain ARTAS® to you, and answer any questions you may have. RHRLI believes you should understand as much as you can about hair loss, so we hope that you found these 5 myths about hair loss to be informative.